The New York Post is reporting that Apple will shortly begin selling iPhone ringtones through the iTunes Store by allowing users to convert any iTunes song into a ringtone for an additional fee. Perhaps even more interesting is the claim that "Apple will also allow users to convert songs they have previously purchased through iTunes into a ringtone" and that users will be able to use any part of the song. From Apple's perspective this seems like an absolute no-brainer, with ringtones being a multi-billion dollar business worldwide. From a user perspective, however, the prospect of paying even more to turn I song I already bought into a ringtone is asinine, especially considering that there are free methods for getting ringtones on your iPhone. What do you think? What (if anything) would you be willing to pay to convert your iTunes purchases into iPhone ringtones? 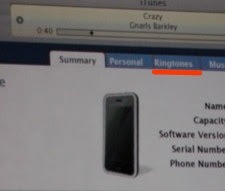 (The image shows a Ringtone tab in iTunes that engadget captured back in January at the iPhone's debut).